Starbucks Corp. announced it was increasing its prices for certain types of packaged coffee as well as for other products. This came after other coffee makers responding to the increase in costs of raw coffee earlier in the year did the same. Starting early next week, some beverages sold at stores that are company-operated in the U.S. will increase from 5 cents to 20 cents each. A cup of venti-sized brewed coffee that is 20-ounces will be priced at $2.35, which represents an increase of 10 cents or 15 cents based on the market it is purchased it. Starbucks said that the price increases on the different beverages in stores would increase the average ticket price by under 1%. 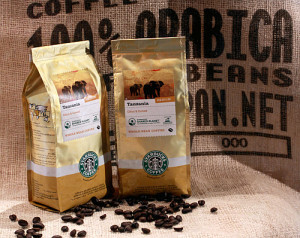 The prices of packaged coffee from Starbucks sold in supermarkets will go up 8% on average starting July 21. That means that it will average about $1 more per bag so a bag of 12 ounces that cost $8.99 will not be $9.99. A K-cup coffee-pack that makes one cup, VIA instant and Seattle’s Best Coffee will all remain the same prices. Packaged coffee that is sold in Starbucks stores will also remain the same price. Arabica futures reached their highest in over two years in the latter part of April. Futures prices since have fallen by close to 20%, but prices of retail coffee often are behind the futures market by nearly two months. This month J.M. Smucker Co became the first large roaster in the U.S. to increase its prices of coffee in close to three years, when it said prices would go up 9% on its Dunkin Donuts coffee in packages and Folgers. A few days after Smucker’s announcement, Kraft Foods Group said it would increase its price of Yuban and Maxwell House coffee brands by 10%. The increase in prices came following predictions from forecasters of a drought in Brazil where half of the world’s coffee beans that are Arabica are found and a drought would curtail their supply. Starbucks, Folgers and Smucker each increased their coffee prices on shelves of supermarkets during the first three months of 2011 by between 10% and 20%. During mid 2011, the Arabica coffee market started dropping and fell by as much as 50% by last 2013, which prompted makers of coffee to lower prices. However, price decreases at the retail level did not wipe out the coffee company increases.